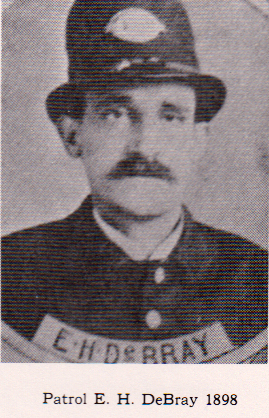 Police Officer Edward DeBray was shot and killed while attempting to arrest three men for fighting at the intersection of Holderness Street and Gordon Street. He had been notified of the fight by another citizen and followed the man to the scene. When he arrived two of the suspects surrendered but the other started walking away. Officer DeBray called out to the man to halt. The man turned and fired at Officer DeBray, but missed. Officer DeBray ran to where the man had ducked behind a car. The suspect shot at Officer DeBray again, striking him and fatally wounding him. The suspects was convicted of voluntary manslaughter and was sentenced to 16 years in prison. Officer DeBray had served with the Atlanta Police Department for four years.